You make a pot by throwing it on the wheel, by using a slab, by pinching, or coiling or a combination of building techniques. It is dried until leather-hard, so the foot can be trimmed. Then, the piece is altered by cutting and/or folding. Next, a slip (liquid clay paint) called Terra Sigilata (http://en.wikipedia.org/wiki/Terra_sigillata), will be sprayed onto the piece and will be dried slowly. The piece is burnished with some baby oil and spoon, stone or some plastic to give it a nice shine and to close the pores. It has to dry slowly and completely. The work is fired to cone 06 (or 1795 degrees F) or lower. This strengthens the clay and greatly reduces the number of pots lost during an alternative fire. Your piece needs to be hot for you to be able to burn horsehair on it. So, you put it again in a kiln: a raku gas kiln or an electrical kiln. You can heat it up quite fast from 2 to 3 hours till around 1350 F.
You protect yourself with gloves and mask before you open up the lid and take out the piece. You put the piece on refractory bricks on a wheel and put horsehair on and/or sugar and/or feathers. You can leave it white or spray with ferric chloride (the fumes are very dangerous, so wear a mask) to get a wonderful color development from brown to yellow. This all happens in a few moments: from the pot is still too hot to too cold and you can not burn anymore. Then you have the pot cool down, clean it up and scrub it to get off some ferric chloride what didn’t burn in. After a couple of days all the colors will have fully developed and floor wax is put on for a nice satin shine and preservation of the colors. The easiest way to describe a pit fire is to have you think of a camp fire! A bed of sawdust is first laid to cushion the vessels and also provides combustible material at the bottom of the pit. Chemicals (rock salt, copper carbonate, and cobalt carbonate) are sprinkled on the sawdust. These chemicals, when burned, help produce colors on the clay (burgundy, oranges, yellows, blues and black from the smoke of the sawdust). Next, the pots are put on the sawdust. Cow dung patties are now piled around and on the pots, completely covering them, followed by kindling. Then the bonfire is lit and all you can do is let mother nature work her magic!. The fire usually burns for a couple of hours. After cooling down we look with big surprise at what colors have developed and where the fire licked the pots and left swirls and patterns with a natural play. A wax can be put on for some shine and for retaining the colors, but it is not a glaze. Also, since it is porous, it is not recommended for outdoor use in climates where temperatures dip near or below freezing. She uses a red clay for the “Kamakura-Red” glaze to get her very deep color. When she fires it multiple times it looks like it develops the most stunning effects. The engraving is done in the leather-hard stage of the piece. Black slip is applied and the piece is bisque fired. Then the “Kamakura-Red” glaze is sprayed on and the pot is fired again. First, you form the piece and trim it if necessary. Next, the piece dries completely and is fired for the first time in a kiln: bisque firing. Then, the pot is being glazed with a white opaque glaze and a design is painted with a cobalt blue stain with a brush on the pot. After the glaze firing you can use and enjoy it. You make your pot, trim it and keep it leather-hard, because then you still can alter the piece by cutting and/or folding. And, while leather-hard, slips (liquid clay paints) are sprayed or painted on the piece and it is dried to the point that you can engrave a design. You can also sprays slip decorations onto the pot by using templates. Dry it slowly and completely. Next, the kiln is bisque fired. Finally, a clear glaze is sprayed onto the piece, with some stain colored glazes and it is fired for the second time. The pots are heated up again for the horsehair technique in the electric kiln until around 1250 F or 650 C and taken out of the kiln. You put the horsehair or other materials on the red hot pot and fume it with ferric chloride, which develop into the most exquisite colors from brown to orange to yellow. The pots are fired for pitfire in a pit with sawdust, salt and copper carbonate, cow dung patties and wood on top. The play of the fire shows the results on the pieces in the colors of white, red, blue-ish to black. 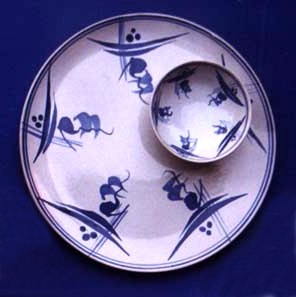 and enhances the crazing in the glaze developed by the tension between the glaze and the clay after firing. B. She works with the earthenware red/brown low fire clay. It gives limitless possibilities in decoration with slips, engraving and use of colors. After throwing and trimming the forms, she alters them through cutting and/or folding, pasting, all the time trying to keep the shape interesting and in harmony with itself. Then she sprays slips (liquid clay paint) on the shapes. Every color is being used, and yellow is one of her favorites. 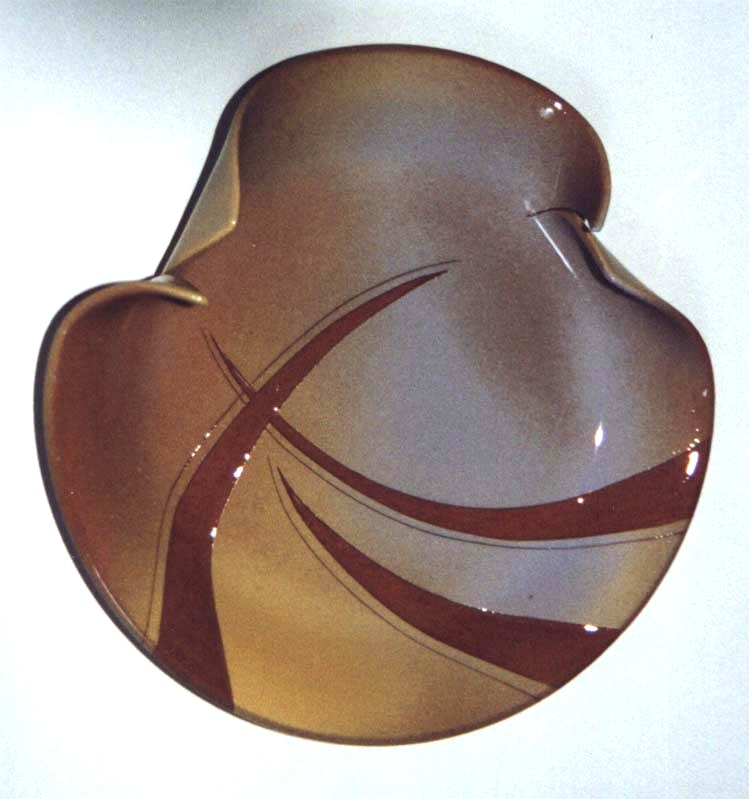 She creates her designs by using templates or by engraving decorations in the piece after spraying color slips on it to have the red/brown color of the clay reappear or a combination of both. She also engraves directly into the clay without spraying slips and a white glossy glaze will enhance the decoration and give it a deeper dimension. Her designs are a play with lines and curves. It enhances the form and lifts it up. The pieces are fired in an electric kiln. Functional ware can be put in the dishwasher, but is not microwave or oven safe.